Today marks the opening of Hanukkah or Festival of Lights which will last 8 days. 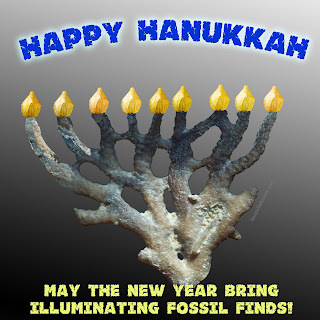 As a greeting to those who celebrate this event and also enjoy paleontology, this graphic was created with some Mississippian (Carboniferous) fossils and a lot of Adobe Photoshop. The fossils are a Fenestella bryozoan in remarkable intact 3-D form and a Pentremites blastoid. 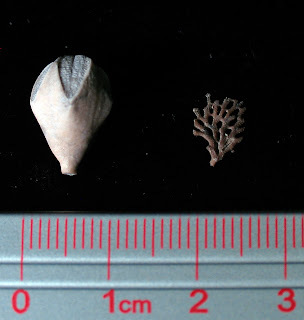 Both specimens were found in Indian Spring formation of Crawford County, Indiana. The picture below shows the two fossils used to create this graphic. The bryozoan was photographed under the microscope at 23x. If you found this graphic interesting, visit the blog on December 25th and see the Christmas tree graphic!